For Ages: 8 to 10yrs., 10 to 14yrs. There was once a princess of England who was a most charming princess when she wanted to be, but as with many other young people, royal or not, she was someone who was quite sure of what she wanted, and when she wanted it, and didn't mind saying so. And there was one thing she knew, and that was she did not want to marry. Of course many suitors came to call but she refused them all, scorning each one for even trying to woo her. The strong energy and high spirits of the Princess were known far and wide. There was a Prince of Denmark who became fascinated with her. He sent word to the English palace, asking the King of England for his daughter's hand in marriage. This is how that sort of royal match happened in those days. When the King told his daughter of this, the princess answered that she would rather earn her bread by spinning all her life than to marry such a poor and miserable prince as the prince of Denmark. However, the young prince was determined to win her. He dispatched messengers with letters, and sent with the letters a gift for her of six beautiful horses, white as milk, with pink muzzles, golden shoes, and scarlet saddles. Such fine horses as these had never before been seen in England. The King was much impressed, and said to his daughter that a prince who could send such a fine gift must at least be considered for a suitor. "What part of what I want do you not understand, Father?" Only a princess could speak in this manner to a King. "Father, I told you a million times I have no wish to marry - not to this fellow, or anyone!" So that her message was entirely clear, the princess ordered the grooms to cut off the manes and tails of the six horses, to soil them with dirt, and return to Denmark with the message that rather than be married to him she would sit in the streets and sell pottery. When he learned of this response, the King of Denmark became enraged. He declared that he would put to sea with all his ships and go to war with England at once to avenge the insult. His son begged him, however, to hold off on any such action. Instead, the prince built a ship, a ship so beautiful and costly that its like had never been seen before. The prince gave the sailors a letter to deliver to the king of England, asking his daughter to accept him in marriage, and to receive the fabulous ship as an engagement gift. The ship commanded considerable attention in England, no one having seen such a magnificent vessel before. The King was more impressed than ever, and begged his daughter to accept the proposal without delay. A suitor so wealthy and generous, so true and devoted as this prince, he urged her, certainly deserved a favorable answer. But that night the Princess gave orders for the magnificent ship to be sunk to the bottom of the ocean. In the morning, she told the sailors to find their way as best they could to their home country. She would rather wash cups and plates than to marry, and certainly not this poor excuse of a prince from Denmark. Upon hearing about the fate of his ship and the disdainful answer of the princess, the King of Denmark was more enraged than ever. He determined to man his fleet and take a bloody revenge. The prince prevailed on him one last time, however, vowing solemnly that he could turn the tide. And so the prince left Denmark quite alone and reached England. Since no one knew who he really was, he decided to call himself Greyfoot. Disguised in an old hat, dingy clothes, and gray wooden shoes, he arrived at the English palace towards evening. He found a herdsman and asked for work. That night the prince slept with the cows in the stable. The next morning the prince -- now Greyfoot -- began work as a herdsman's helper by driving the royal cattle to their watering-hole, and returning them safely back to the royal barn at the end of the day. The path to the watering-hole happened to travel exactly below the windows occupied by the princess. As Greyfoot approached below the princess' window, he pulled from a bundle he had brought with him a golden spindle, a rod used in spinning wool, and proceeded to use it in driving forth the cows. The princess caught a glimpse of the sun shining on the golden spindle. She took a great fancy to it, and sent someone down to ask whether the beggar were willing to sell it. Greyfoot answered to her servant that he did not care to sell it for money. However, he said that would gladly give it to her if she would only answer a single question he would put before her. When she heard this, the princess would not agree! "No!" she declared to her servant. "Tell that herdsman a princess is not obliged to answer any question put before her by anyone at all." "Very well," answered Greyfoot to the servant when he heard her response. "Then let Her Majesty know that I shall keep my spindle." Yet she yearned for that beautiful golden spindle. And so she agreed to his terms. "Very well, then, Princess," said Greyfoot, looking up at the Princess as she leaned out the window sill. "Answer me this question: Is the sky blue?" The Princess laughed. Why kind of question was this? She answered with glee, "Yes, of course yes!" And the beggar gave her servant his golden spindle to take up to her mistress. The next morning, the Princess noticed Greyfoot chasing the cows with a golden reel, a spool that turns as a spinning handle is turned. At once she sent one of her maids down to ask whether the golden reel could be bought. "Yes," was the message that Greyfoot relayed to the Princess through her maid, "and the price is the same as yesterday. The princess must answer a single question that I put before her." When she heard this, the princess laughed to herself, remembering the silly question this run-down fellow had asked the day before. But as the treasure could be had in no other way, she agreed. "Then here it is, Princess," said the beggar, looking up. "Tell me this: Is the grass green?" Again, the Princess laughed. "Yes, of course yes!" she cried. And so she got the golden reel, too. The third morning Greyfoot drove the cattle to the watering-hole using a weaver's shuttle of pure gold. The princess sent for him. When he appeared before her, she asked his name and he told her. "Very well, Greyfoot," said she. "How much do you ask for THIS treasure of yours? Another mind-stumping question, I suppose?" And Greyfoot answered, "Your Highness, all I ask is that your answer be the same as it was twice before; that you agree to say, 'Yes,of course yes!' to the question I will put before you." The princess chuckled. Perhaps I'll be asked this time whether birds fly, or if fish swim, she thought. "Very well, then Princess," said the beggar. "Are you ready?" She smirked. "Then here is the question," said Greyfoot. "Will you marry me?" The Princess was astonished. "Surely you can't expect ME, the Princess of all England, to throw my life away on a shabby beggar such as you!" The King overheard his daughter's cries. When he heard the entire situation he thundered, "Daughter, I cannot believe that you gave your word to marry this man! But so you have, and so marry him you must. There is nothing more to discuss. The two of you, be off!" The King made hasty arrangements for a wedding. Shortly afterward Greyfoot and the Princess were married. Thus the Princess was forced to leave her life of royal comforts. When they passed the barn door, Greyfoot turned to the Princess, saying, "You cannot walk on these dusty roads in your silk gown and satin shoes. You must change your clothes before we depart." "Can my life get any worse?" murmured the Princess, but they visited the herdsman's wife, who gave the Princess - who was now Greyfoot's wife - a plain dress of linsey-woolsey, a woolen jacket, a cape, and a pair of heavy shoes. At first they walked on opposite sides of the road, without speaking. But after awhile the Princess raised her eyes to look at the man who was now her husband. To her astonishment she noticed that he was neither old nor ugly, but really a handsome young man, in spite of his old and tattered clothes. "Yet he tricked me, and I like it not!" she reminded herself. The Princess was not used to walking very far, and especially with such heavy shoes. She was soon exhausted. "Greyfoot!" she said, "slow down. Do not walk so fast!" "Ah," he said, "it is not easy having a princess for a wife. Very well then, I'll slow down, but move on we must." At last they arrived at a seaport. There Greyfoot obtained passage for himself and his wife as servants aboard a ship. The Princess felt much relieved when at last the shoreline of her father's land vanished from sight. "At least no one I know will see me anymore in this state," she said glumly. She had no idea where they were bound, nor did she care. The voyage ended in Denmark. When they had safely landed, Greyfoot proceeded to rent a small cabin in the neighborhood of the royal palace. It had only one little room with a stone floor and an open fireplace. They both had work to do. He would earn money where he could, and she must prepare their meals. "And to think," she said, sighing and looking about the dark, damp cabin with spider's webs in all the corners, "that I could have married the Prince of Denmark." Greyfoot, who as you know was really the Prince of Denmark said only as gently as he could, "It's no use thinking of such things. You might as well get used to what we can afford. We need to make do as best we can." In a little while, Greyfoot went out and returned with an old spinning wheel and a bundle of rough flax, to be spun into yarn. "I will go out to find work to earn some money," he said. "But neither of us can afford to be idle. Spin this flax into yarn, and we might make a few pennies from your efforts." Greyfoot went to the palace at Denmark, his own palace. No one recognized him in his old clothes, and he found work there as a woodcutter. The Princess knew how to spin flax though she hadn't done it very much. She spent most the day spinning until her fingertips were raw and her knees shaked under her. The yarn was forever becoming torn and knotted. Every evening, when Greyfoot returned and examined her work, he sighed. They would not earn even a few pennies with this. Then he shared with her a loaf of bread and a jug of milk he had bought on the way home with the little money he had earned selling firewood. And they went to bed on their hard cots. One evening Greyfoot showed his wife a wheelbarrow filled with pottery. "Here's a chance for you to be useful," he said. "I had to use our savings for a deposit, and I had borrow the pots on credit, but it will be worth it when you sell them all by the end of the day. It's easy enough work to stand behind a table at the marketplace and sell pots, even for a princess." The next day Greyfoot went to his work as usual, and his wife set out for the town with her pottery. But just when she had managed to sell a few pots and was feeling good about the money she might finally earn, a troop of knights came galloping down the street. One of the horses got wild and rushed against her table. The pots fell and shattered in a thousand pieces under the heavy hoofs which trampled upon them. The riders went on their way, but the poor Princess could do nothing but clean up the mess and return to her cabin. Collapsing on a chair, she bemoaned her loss. In the evening, when Greyfoot returned, she told him of her terrible day. "Now our situation is worse than ever," said he, shaking his head, "for I have no money to pay for the pottery that's been broken." So they could do nothing but share their daily dinner of bread and milk, and go to bed early. Greyfoot came home the next evening with some exciting news. "I found a good job for you at the palace," he said. "They are preparing for a wedding, and tomorrow you are to help out in the kitchen. Do your best and make yourself useful. Maybe they will keep you and pay you good wages. Tomorrow they will give you your meals and twenty pennies besides." The next morning, Greyfoot said to his wife, "Today I must stay at home. I feel a sickness coming on me. I will rest and try to get better." She became alarmed and said if he was ill she would not think of leaving him. He answered however that she was expected at the palace and must go. So she kissed him good-bye, hoping he would soon feel better, and promised to return as quickly as she could. So the Princess spent the whole day in the royal kitchen. At the end of the day, to her fright, she slipped and spilled a great pot of stew on the floor. The head cook yelled at her loudly and fired her on the spot. Shamed and tearful, she returned to the cabin. Greyfoot seemed better but he could tell something was troubling her, and asked her what it might be. When she told him what had happened in the kitchen, her husband said not to worry. At least she had earned a few pennies for the day's work. And besides, since he was feeling better he had gone down to the road and heard some more exciting news. An order had been issued announcing that the Prince of Denmark was to be married to a Russian princess. The bridal-gown for the Russian bride was ready, but the Russian princess herself was delayed on the sea by wind and waves, and so was unable to be fitted for the wedding gown in time for the ceremony. The next day, every girl and woman was to present herself at the palace. Whoever matched the measurements of the Russian princess would be chosen to try them on for size and fit. "To be fitted for a fine gown is surely a job you could do well," said Greyfoot. "And who knows? Maybe your wages could pay off our debts." In the morning Greyfoot declared that the illness had come on again and this time worse than ever. Still, he would not keep her from going to the palace. She hesitated but as he insisted, she gave him a kiss on the cheek and left. The royal measurer was busy among the many women assembled in the courtyard. It seemed impossible to find anyone who fit the right measurements. But when at length he reached Greyfoot's wife, he declared that she was the very person they wanted. Now she was taken into the palace, and attired in a gorgeous wedding gown, a bridal veil, and a pair of exquisite slippers. When finally the crown was placed on her head, everyone declared that the REAL princess could hardly be more charming than she. When the seamstresses were finished, the Princess started to take off the bridal finery, but the chief lady-in-waiting stopped her. "We still need you to play the part for the rehearsal for the royal wedding," she said. "The court must practice the event, and the bride will be very late arriving from Russia." In a little while, a beautiful carriage drawn by six milk-white horses was seen at the door. Greyfoot's wife was ushered to enter the carriage. The real Prince of Denmark was already seated in the carriage. Casting her eyes downward, the princess felt grateful that the Prince couldn't possibly know that the woman sitting beside him had once been the proud Princess of England who had scorned his many offers of marriage. They drove along the road until the carriage passed Greyfoot's cabin. All of a sudden she saw with alarm from a distance that the cottage was on fire. The woman in the carriage uttered a piercing shriek. She cried, "Stop! Stop this carriage at once! My husband Greyfoot was ill at home when I left him this morning, and he may not have escaped from the fire!" She tried to jump out, but only succeeded in tangling her long train and veil and dropping her crown. The Prince now spoke to her for the first time, and said, "What? Are you talking about that woodcutter Greyfoot who has missed work these last couple of days? You would ruin the royal bridal finery for the likes of him? A fine young woman like you should leave such a tramp anyway." She answered, "He is my husband and always shares what he has with me, though I'm the one who's been of little use to him. Why, even if you offered me the place that I am now occupying as your real bride, I would refuse it, and return to the cabin where I have lived the happiest part of my life!" The prince smiled. He said, "But you are already my bride." Now she looked at him directly and saw that he, the Prince of Denmark, and her husband Greyfoot were one and the same. Throwing her arms around him, she said that she was glad he was not burned up in the fire, and how could it be that he was really the Prince of Denmark? And so they laughed and chuckled and said over and over how it's really something, how things can change with time and end up so differently from what you thought, and so much the better for it. The Prince of Denmark and the Princess of England were wed again, this time for all to see. They were as content in the palace as they had become together in their humble cottage. And so the Princess of England became the happy Princess of Denmark and in the years to come, its good queen. Question 1: Why did the princess love Greyfoot? Question 2: How did learning to love Greyfoot change the princess? "Greyfoot" is based on "Greylegs," a story from Danish Fairy and Folk Tales by J. Christian Bay (Harper & Brothers Publishers: New York, 1899), pp. 35-46. There are many stories of haughty princesses being tricked into marrying royal men in disguise who intend to humble them, the most common being "King Thrushbeard" (The Complete Fairy Tales of the Brothers Grimm: Bantam Books, 1987). 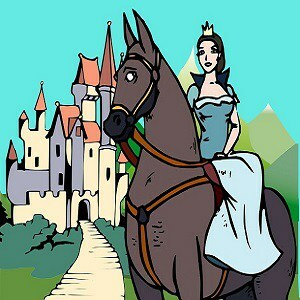 In "King Thrushbeard" the princess is utterly humiliated. In the scene where she is working as a kitchen maid, she sews two jars of kitchen scraps inside her skirt to take home. The king (in truth her beggar-husband) appears in the kitchen (as king) and engages her (as kitchen maid) to dance. The string breaks, the jars fall, and the scraps scatter on the floor. The people laugh at her "a good deal" and "she feels so ashamed that she wish[es] she were a thousand fathoms under the earth." In the story of "Greyfoot," the prince-in-disguise continues to respect the princess and maintain her dignity.